CinemaScope is an anamorphic lens series used, from 1953 to 1967, and less often later, for shooting widescreen movies that, crucially, could be screened in theatres using existing equipment, albeit with a lens adapter. Its creation in 1953 by Spyros P. Skouras, the president of 20th Century Fox, marked the beginning of the modern anamorphic format in both principal photography and movie projection. The anamorphic lenses theoretically allowed the process to create an image of up to a 2.66:1 aspect ratio, almost twice as wide as the previously common Academy format's 1.37:1 ratio. Although the technology behind the CinemaScope lens system was made obsolete by later developments, primarily advanced by Panavision, CinemaScope's anamorphic format has continued to this day. In film-industry jargon, the shortened form, 'Scope, is still widely used by both filmmakers and projectionists, although today it generally refers to any 2.35:1, 2.39:1, 2.40:1 or 2.55:1 presentation or, sometimes, the use of anamorphic lensing or projection in general. Bausch & Lomb won a 1954 Oscar for its development of the CinemaScope lens. By 1950, however, cinema attendance seriously declined with the advent of a new competitive rival: television. Yet Cinerama and the early 3D films, both launched in 1952, succeeded at the box office in defying this trend, which in turn persuaded Spyros Skouras, the head of Twentieth Century-Fox, that technical innovation could help to meet the challenge. Skouras tasked Earl Sponable, head of Fox's research department, with devising a new, impressive, projection system, but something that, unlike Cinerama, could be retrofitted to existing theatres at a relatively modest cost – and then Herbert Brag, Sponable's assistant, remembered Chrétien's "hypergonar" lens. The optical company Bausch & Lomb was asked to produce a prototype "anamorphoser" (later shortened to "anamorphic") lens. Meanwhile, Sponable tracked down Professor Chrétien, whose patent for the process had expired, so Fox purchased his existing Hypergonars from him and these lenses were flown to Fox's studios in Hollywood. Test footage shot with these lenses was screened for Skouras, who gave the go-ahead for development of a widescreen process based on Chrétien's invention, which was to be known as "CinemaScope". CinemaScope was developed to use a separate film for sound (see Audio below), thus enabling the full "silent" 1.33:1 aperture to be available for the picture, with a 2:1 anamorphic squeeze applied that would allow an aspect ratio of 2.66:1. When, however, developers found that magnetic stripes could be added to the film to produce a composite picture/sound print, the ratio of the image was reduced to 2.55:1. This reduction was kept to a minimum by reducing the width of the normal KS perforations so that they were nearly square, but of DH height. This was the CinemaScope, or CS, perforation, known colloquially as "fox-holes". Later still an optical soundtrack was added, further reducing the aspect ratio to 2.35:1 (1678:715). This change also meant a shift in the optical center of the projected image. All of Fox's CinemaScope films were made using a silent/full aperture for the negatives, as was this studio's practice for all films, whether anamorphic or not. In order to better hide so-called "negative assembly" splices, the ratio of the image was later changed by others to 2.39:1 (1024:429) and, finally, to 2.40:1. All professional cameras are capable of shooting 2.55:1 (special 'Scope aperture plate) or 2.66:1 (standard "Full"/"Silent" aperture plate, preferred by many producers and all optical houses), and 2.35:1 or 2.39:1 or 2.40:1 is simply a hard-matted version of the others. Previously, stereo sound in the commercial cinema had always employed separate sound films; Walt Disney's 1940 release Fantasia, the first film with stereophonic sound, had used Disney's Fantasound system, which utilized a three-channel soundtrack played from separate optical film. Early post-war stereo systems used with Cinerama and some 3-D films had used multichannel audio played from a separate magnetic film. Fox had initially intended to use 3-channel stereo from magnetic film for CinemaScope. However, Hazard E. Reeves' sound company had devised a method of coating 35 mm stock with magnetic stripes and designed a 3-channel (left, center, right) system based on three 0.063-inch-wide (1.6 mm) stripes, one on each edge of the film outside the perforations, and one between the picture and the perforations in approximately the position of a standard optical soundtrack. Later it was found possible to add a narrower 0.029 in (0.74 mm) stripe between the picture and perforations on the other side of the film; this fourth track was used for a surround channel, also sometimes known at the time as an "effects" channel. In order to avoid hiss on the surround/effects channel from distracting the audience the surround speakers were switched on by a 12 kHz tone recorded on the surround track only while wanted surround program material was present. By this time Chrétien's 1926 patent on the Hypergonar lens had expired while the fundamental technique that CinemaScope utilised was not patentable because the anamorphoscope had been known for centuries. Anamorphosis had been used in visual media such as Hans Holbein's painting, The Ambassadors (1533). Some studios thus sought to develop their own systems rather than pay Fox. In response to the demands for a higher visual resolution spherical widescreen process, Paramount created an optical process, VistaVision, which shot horizontally on the 35 mm film roll, and then printed down to standard 4-perf vertical 35 mm. Thus, a negative with a finer grain was created and release prints had less grain. The first Paramount film in VistaVision was White Christmas. VistaVision died out for feature production in the late 1950s with the introduction of faster film stocks, but was revived by Industrial Light & Magic in 1975 to create high quality visual effects for Star Wars and ILM's subsequent film projects. Many European countries and studios used the standard anamorphic process for their wide-screen films, identical in technical specifications to CinemaScope, and renamed to avoid the trademarks of Fox. Some of these include Euroscope, Franscope, and Naturama (the latter used by Republic Pictures). In 1953, Warner Bros. also planned to develop an identical anamorphic process called Warnerscope but, after the premiere of CinemaScope, Warner Bros. decided to license it from Fox instead. Fox had introduced the original 35 mm version of CinemaScope in 1953 and it had proved to be commercially successful. But the additional image enlargement needed to fill the new wider screens, which had been installed in theatres for CinemaScope, resulted in visible film grain. A larger film was used to reduce the need for such enlargement. CinemaScope 55 was developed to satisfy this need and was one of three "high-definition" film systems introduced in the mid-1950s, the other two being Paramount's VistaVision and the Todd-AO 70 mm film system. Fox determined that a system that produced a frame area approximately 4 times that of the 35mm CinemaScope frame would be the optimal trade-off between performance and cost, and it chose the 55.625 mm film width as satisfying that. Camera negative film had larger grain than the film stocks used for prints, so there was a consistent approach in using a larger frame on the film negative than on prints. Since the image area of a print has to allow for a soundtrack, a camera negative does not. CinemaScope 55 had different frame dimensions for the camera negative and struck prints. The negative film had the perforations (of the CS "Fox-hole" type) close to the edge of the film and the camera aperture was 1.824" by 1.430" (approx. 46 mm x 36 mm), giving an image area of 2.61 sq. inch. This compares to the 0.866" by 0.732" (approx. 22 mm x 18.6 mm) frame of a modern anamorphic 35 mm negative, which provides a frame area of 0.64 sq. inch. On the print film, however, there was a smaller frame size of approximately 1.34" x 1.06" (34 mm x 27 mm) to allow space for the 6 magnetic soundtracks. Four of these soundtracks (two each side) were outside the perforations, which were further from the edges of the print film than in the negative film; the other two soundtracks were between the perforations and the image. The pull-down for the negative was 8 perforations, while for the smaller frame on the print film, it was 6 perforations. 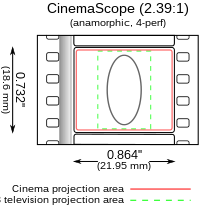 In both cases, however, the frame had an aspect ratio of 1.275:1, which when expanded by a 2:1 anamorphic lens resulted in an image of 2.55:1. A camera originally built for the obsolete Fox 70 mm "Grandeur" film format more than 20 years before was modified to work with the new 55 mm film. Bausch & Lomb, the firm that created the original anamorphic CinemaScope lenses, was contracted by Fox to build new "Super CinemaScope" lenses that could cover the larger film frame. Fox shot two of their Rodgers and Hammerstein musical series in CinemaScope 55: Carousel, and The King and I. But it did not make 55 mm release prints for either film; both were released in conventional 35 mm CinemaScope with a limited release of The King and I being shown in 70 mm. Fox soon discontinued this process, as it was too impractical for theaters to re-equip for 55 mm prints. The company substituted Todd-AO for its wide-gauge production process, having acquired a financial interest in the process from the Mike Todd estate. Subsequent to the abandonment of CinemaScope 55, Century, which had made the 55/35mm dual-gauge projector for Fox (50 sets were delivered), redesigned this projector head into the present day 70/35mm Model JJ, and Ampex, which had made the 55/35mm dual gauge "penthouse" magnetic sound reproducer head specifically for CinemaScope 55, abandoned this product (but six-channel Ampex theater systems persisted, these being re-purposed from 55/35mm to 70mm Todd-AO/35mm CinemaScope). Although commercial 55 mm prints were not made, some 55 mm prints were produced. Samples of these prints reside in the Earl I. Sponable Collection at Columbia University. Several 55/35mm projectors and at least one 55/35mm reproducer are in the hands of collectors. Cinemascope 55 was originally intended to have a six-track stereo soundtrack. 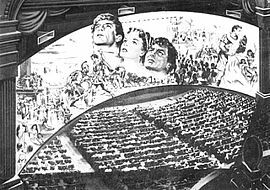 The premiere engagement of Carousel in New York did use one, recorded on magnetic film interlocked with the visual image, as with Cinerama. This proved too impractical, and all other engagements of Carousel had the standard four-track stereo soundtrack ("sounded" on the actual film) as was then used in all CinemaScope releases. In 2005 both CinemaScope 55 films were restored from the original 55 mm negatives. Lens manufacturer Panavision was initially founded in late 1953 as a manufacturer of anamorphic lens adapters for movie projectors screening CinemaScope films, capitalizing on the success of the new anamorphic format and filling in the gap created by Bausch and Lomb's inability to mass-produce the needed adapters for movie theaters fast enough. Looking to expand beyond projector lenses, Panavision founder Robert Gottschalk soon improved upon the anamorphic camera lenses by creating a new lens set that included dual rotating anamorphic elements which were interlocked with the lens focus gearing. This innovation allowed the Panavision lenses to keep the plane of focus at a constant anamorphic ratio of 2x, thus avoiding the horizontally-overstretched "mumps" effect that afflicted many CinemaScope films. After screening a demo reel comparing the two systems, many U.S. studios adopted the Panavision anamorphic lenses. The Panavision technique was also considered more attractive to the industry because it was more affordable than CinemaScope and was not owned or licensed-out by a rival studio. Confusingly, some studios, particularly MGM, continued to use the CinemaScope credit even though they had switched to Panavision lenses. Virtually all MGM "CinemaScope" films after 1958 are actually in Panavision. Magnetic-striped prints were expensive to produce; each print cost at least twice as much as a print with a standard optical soundtrack only. Furthermore, these striped prints wore out faster than optical prints and caused more problems in use, such as flakes of oxide clogging the replay heads. Due to these problems, and also because many cinemas never installed the necessary playback equipment, magnetic-sound prints started to be made in small quantities for "roadshow" screenings only, with the main release using standard mono optical-sound prints. As time went by roadshow screenings were increasingly made using 70 mm film, and the use of striped 35 mm prints declined further. Many CinemaScope films from the 1960s and 1970s were never released in stereo at all. Finally, the 1976 introduction of Dolby Stereo – which provided similar performance to striped magnetic prints albeit more reliable and at a far lower cost – caused the 4-track magnetic system to become totally obsolete. Similarly, the 2016 release La La Land was shot on film (not digitally) with Panavision equipment in a 2.55:1 widescreen format, but not true CinemaScope. However, the film's opening credits do say "Presented in CinemaScope" ("presented," not "shot") as a tribute to 1950s musicals in that format. This credit appears initially in black-and-white and in a narrow format. It then widens to widescreen and dissolves to the old-fashioned CinemaScope logo, in color. Recently, the two 2018 blockbuster films Jurassic World: Fallen Kingdom and Deadpool 2 were shot in CinemaScope. ^ "CinemaScope: Selected Documents from the Spyros P. Skouras Archive | ILIAS CHRISSOCHOIDIS". Academia.edu. 1970-01-01. Retrieved 2016-09-01. ^ "Spyros P. Skouras, Memoirs (1893-1953) | ILIAS CHRISSOCHOIDIS". Academia.edu. 1970-01-01. Retrieved 2016-09-01. ^ "CinemaScope at the Widescreen Museum". Widescreenmuseum.com. 1953-09-24. Retrieved 2012-06-10. ^ "Widescreen Museum - The CinemaScope Wing 6 - CinemaScope 55". www.widescreenmuseum.com. ^ "American Cinematographer: June 2005". www.theasc.com. ^ "Restoring Cinemascope 55". www.in70mm.com. ^ "Shot in CinemaScope, La La Land vibrantly romances the olden days of Hollywood," http://motion.kodak.com/kodakgcg/us/en/motion/blog/blog_post/?contentid=4295000679#, January 10, 2017. ^ "Review: La La Land". 14 December 2016. ^ Desowitz, Bill (10 November 2016). "Oscars 2017: Why Cinematographers for Scorsese, Chazelle and More Shot on Film". ^ Sciretta, Peter (April 24, 2018). "'Jurassic World: Fallen Kingdom' Director J.A. Bayona on Bringing Suspense Back to the Franchise [Set Visit Interview] (page 2 of 3)". /Film. Retrieved April 25, 2018. Wikimedia Commons has media related to CinemaScope. ASC article about the restoration of "Carousel" and "The King and I"